I was in the process of packing for our move to Minneapolis when I got the bright idea of cataloguing my scrapbook supplies. I'd barely started the inventory when I began to think about scrapbook insurance. And when I say scrapbook insurance, I mean my tendency to buy two of everything. I recognize that hoarding is a form of mental illness, which is why I have great empathy for people who, unable to throw anything away, end up suffocating in their own clutter. But, as I've previously confessed, I'm more into collecting scrapbook stuff than using it. I justify my can't-have-just-one philosophy this way: What if I screw up a page or run out of something mid-project, and can't find more? Like a baseball team with a bad bullpen, I need insurance runs. Of course, that got me thinking about another form of protection. If the moving van is hijacked, how will I ever convince an insurance company that I lost $3,000 in paper? So it was with some trepidation that I began to take stock of my acquisitions. My initial advice: Don't try this at home. Sitting on the floor of my scrapbook room, counting sheets of paper, my foot fell asleep at 1,000 and I had three similar-sized stacks to go. And that's just the 12-by-12 patterned paper. I did the math: 5,000 sheets of paper, times 75 cents a sheet, equals a call to Chuck Tebbs, insurance agent. You don't need to make a list of scrapbook items and specific values to make an insurance claim. You can ballpark it. And, as long as your personal property limits are high enough, you are probably covered under your homeowner's policy. But, this only applies if you do not make money from scrapbooking. If you do, you need a commercial insurance policy, which, depending on the carrier, costs about $500 a year. No doubt, this comes as a shock to scrapbookers who make a few bucks teaching classes, hosting crops, making wedding albums, selling Christmas cards, serving as ad hoc designers for suppliers or writing a monthly scrapbook column. 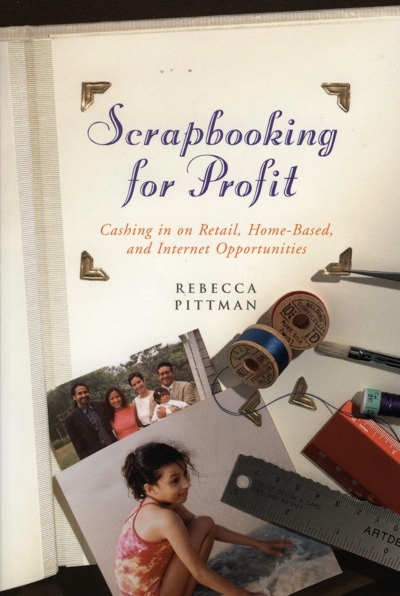 According to Rebecca Pittman, author of Scrapbooking for Profit, if you offer workshops or crops from your home, you may need bodily injury and personal liability coverage in case a customer or other business-related visitor gets hurt on your property. Product liability insurance also is recommended in case someone sues you for an injury caused by a product you sold or distributed to them, even if you had nothing to do with its design. Case in point: Embellishments recalled by companies because they were coated in lead-based paint or posed a choking hazard. And, finally, you should make sure your auto policy includes business travel and, if it doesn't, look into purchasing an insurance rider. Chuck says that some companies insure work-at-home employees on their corporate policies, but I'm willing to bet that isn't the case for scrapbook companies. In fact, they only exacerbate the problem, by paying designers in - you guessed it - scrapbook supplies. Policies and coverage, even for homeowners' policies, vary greatly by company, so it is wise to check with your insurance agent before assuming you are protected, Chuck says. For my own protection, I will not publicly disclose the value of all my scrapbooking supplies. But it's safe to say I'll be purchasing a commercial insurance policy and rethinking that other one. SCRAPBOOKING FOR PROFIT: This is an excellent guide book that covers everything from advertising strategies to trademark protection to display dos and don'ts. If you are looking to cash in on retail, home-based or Internet opportunities in scrapbooking, your first investment should be this book.